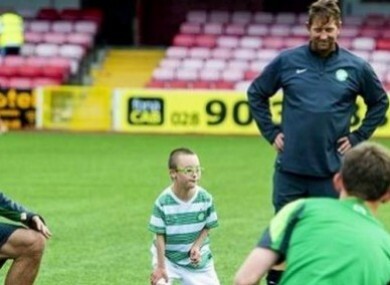 LAST MONTH WE told you how Scottish football fans gave 11-year old Jay Beatty yet another day to remember after Hamilton Academical invited him over to their game with his beloved Celtic and gave the youngster a chance to score in front of the away fans at half time. This was after Jay was brought to the World Cup by Georgios Samaras. Jay, who has Down Syndrome, didn’t disappoint and found the back to the net to rapturous applause from both sets of supporters. Well, the SPFL have, rather brilliantly, included his effort in their Goal of the Month competition for January. Email “11-year old Celtic fan's goal nominted for SPFL Goal of the Month”. Feedback on “11-year old Celtic fan's goal nominted for SPFL Goal of the Month”.